The place where something lives is called its habitat. If you live in a house, then the house is your habitat. This part of the site talks about how to set up a habitat, or home, for your turtle. For most new turtle hobbyists, the easiest kind of habitat to build is in a tank, like the tanks used to keep fish, so that's what we'll be discussing. I hope you're reading this page because you're planning to buy or adopt a turtle, because the best time to set up a turtle habitat is before you get the turtle. Of course, sometimes things don't work out that way. Sometimes people get the turtle first (usually a baby turtle at a fair or carnival), and then realize that it needs a better home than that little plastic carrier. If you already have a turtle and need to set up a habitat quickly because it's outgrown its home, then probably the best thing you can do is quickly set up a simple, larger habitat. The most important things an aquatic turtle needs are proper heating, proper lighting, clean water, and the right food. Concentrate on those things first and forget about substrate, plants, and other fancy things. Then once you have the important things done, you can work on making it fancy later. If you plan to keep more than one turtle in the tank, please read this page before you set up your habit. A big enough tank and stand. You must use a tank designed to hold water, like a fish tank, not a tank designed to hold terrestrial (land-dwelling) reptiles like iguanas or desert tortoises. Terrestrial reptile tanks are not strong enough to fill with water. A way to get the water into the tank. An aquarium water-change kit is the most convenient way, but buckets work, too. You can also use a hose, but make sure it's a hose approved for drinking water. A basking area. This is a dry place where the turtle will "sun itself." Basking is something that aquatic turtles must do to survive and be healthy. Proper lighting to generate warmth and the different kinds of light that turtles need. One or more heaters to keep the water in the turtle's habitat in the correct temperature range. You should choose stainless steel aquarium heaters or heaters enclosed in plastic cages. Turtles can shatter glass heaters and get electrocuted and die! You will also need at least two thermometers: One to measure the water temperature, and one to measure the air temperature at the basking area. A system to keep the water in the turtle's habitat clean. Almost always this means using a filter. If you don't use a filter, you will have to change all the water in the tank every few days. An aquarium water test kit or test strips to check the water chemistry and quality. Test strips are easier for beginners, but test kits are more accurate. A substrate, which is something to line the bottom of the turtle tank, like gravel or Flourite. Unless you plan to use live plants that need something to root in, or to keep digging turtles like soft shell turtles, you don't absolutely need a substrate. An aquarium air pump to aerate the water. This helps discourage the growth of anaerobic bacteria, and turtles seem to like the bubbles. If you also have fish or other animals who breathe with gills (like ghost shrimp), then you must have aeration, or else those animals will die. Decorations, such as artificial plants or an aquarium background. If you're lucky enough to be planning your turtle purchase or adoption before getting a turtle, however, then you can take your time and create a habitat to be proud of. After all, building your turtle's little world is part of the fun of the hobby. You are creating your turtle's entire world! So unless you have a turtle impatiently waiting for the keys to his or her new place, take your time and enjoy the experience. 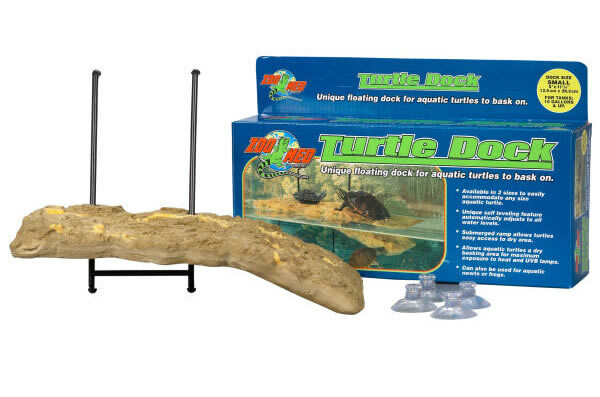 If you plan on raising your turtles from hatchlings, you may want to start with a aquatic turtle habitat starter kit like the Tetra USA STS20003 Turtle Kit. But there are two things you'll need to remember if you choose this option. The first thing you have to consider is that your turtle is going to outgrow a starter-size tank very quickly. You will need at least a 15-gallon tank to start to raise one hatching, and at least a 20-gallon tank to start to raise two. But once they get much bigger than 1.5 inch (3.8 cm) in carapace length, you'll need to start setting up a new habitat for them. Remember that a 15-gallon tank doesn't hold 15 gallons of water unless you mount the basking area on top of it. 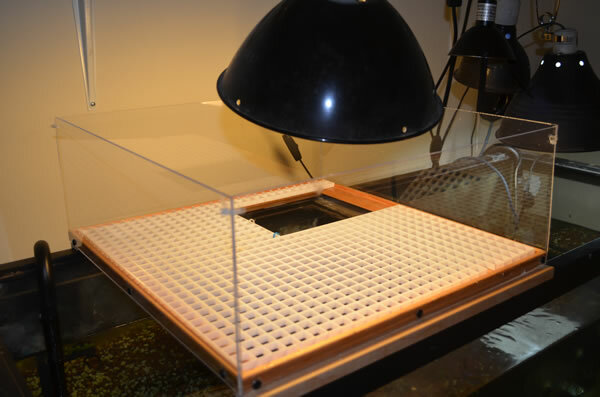 Otherwise, with the basking platform mounted inside the tank, you're losing one-third to one-half the water capacity. With too little water in the tank, the water will get quickly get fouled by the turtles' poo and pee, making it unhealthy for your turtle, smelly, and impossible to keep clean. The second thing you have to do is look at what's included in the kit and "fill in the blanks" with the rest of the things you'll need, especially a heater and a UVA/UVB light source if they're not included (and they're usually not). Most species of hatchling turtles need water temperatures of between 80 - 85 F (26.7 - 29.5 C) until they're about 1.25 inches (3.2 cm) in carapace length order to thrive, and the UVA/UVB lamp is a must in any case. Please refer to the pages on lighting and heating for more information. If you are raising hatchlings and you're not going to use a small tank as a starter habitat for them, then make sure to start with a low water level while your turtles are hatchlings. Baby turtles' lungs aren't very well-developed, so they need shallow water when they're very young. The water should always be deeper than the turtles are wide, however, otherwise they may not be able to right themselves if they get turned upside-down. If they get stuck upside-down underwater, they can drown and die. So if you want to start your habitat in a big tank right from the start, that's fine. Just start with a lower water level and gradually raise it. I like the water level for hatchlings to be between two and three times as deep as the turtles' shells are wide. Once they develop the lung capacity to handle deeper water, you can gradually increase it. That happens pretty quickly. When they can easily swim to the surface of the water from the deepest point, you can start raising the water level a little bit at a time. 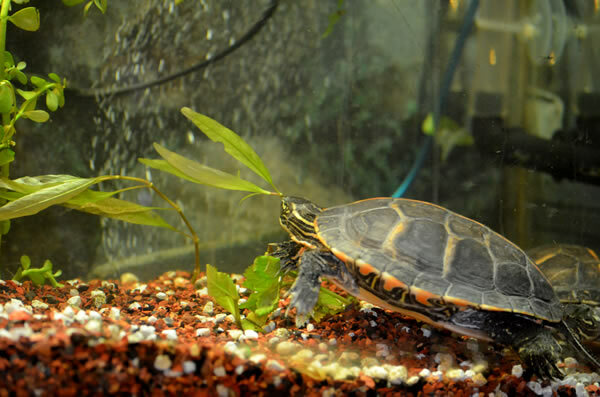 Most aquatic turtle keepers who keep their turtles indoors use aquarium tanks designed for fish. Others prefer large storage containers, others use small-sized children's wading pools, and still other people have tanks custom-designed to fit some spot in their homes. Some people even build indoor ponds for their turtles, which are really cool if you have the space -- and the money. But most people use fish tanks, so that's what we're going to talk about. There are several things to think about when planning a turtle habitat in a tank. Let's look at the most important factors. The next most important thing to consider is the tank's size. If you can, try to get a tank big enough that your turtle will have ten gallons of water for every inch of carapace (upper shell) length when it reaches full size. This way you won't have to buy a bigger tank down the line. A tank that is too small will be much more work to keep clean. The water will be fouled much more quickly and will become unhealthy and smelly. Your turtle won't have enough room to swim in a too-small tank, and if you have more than one turtle, they will be more likely to fight. The shape of the tank you select is also important. 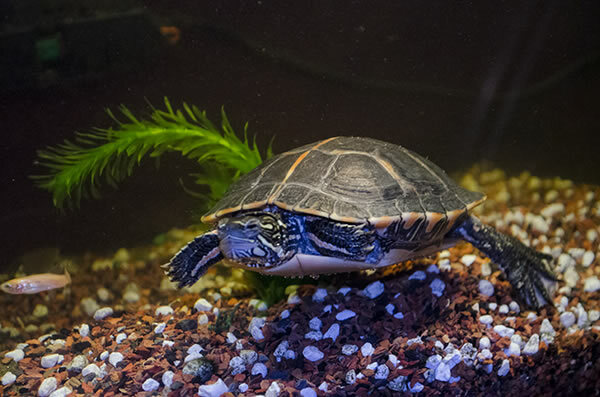 A tank with a low profile, like a 20-long, may be fine while your turtle is very young, but it won't provide nearly enough vertical swimming room for turtles who like deep water, like Painted Turtles and Red-Eared Sliders. For turtles who are poor swimmers like Musk, Mud, and Reeves turtles, however, a shallower tank is better and safer. It's very important that the water in the tank be deeper than the turtle is wide so your turtle can flip itself upright if it gets turned upside-down in the water. If your turtle gets turned upside down in the water and there's not enough water for it to flip over and right itself, it probably will drown and die. So if your turtle is five inches wide, you must have at least five inches of water depth in the tank -- minimum. Aquatic turtles need a dry basking platform where they can sun themselves (although the "sun," in this case, is usually a turtle basking lamp). The basking area can be a commercially-made turtle dock like the one on the right, a log, or even just a rock. But whatever it is, it has to be big enough for the turtle to comfortably fit on, easy for the turtle to climb on to from the water, and high enough that the basking area doesn't stay wet. One of the easiest types of basking areas to use are the floating, shelf-type basking areas like the turtle dock in the picture, which looks like a rock, but is really made of plastic. Floating docks are easy to use, automatically adjust to the water level and don't waste the swimming space underneath. They're a very good choice for beginners. But a rock or log will work just fine, too. If you use something from nature, make sure to boil it first to kill any algae, germs, or harmful microorganisms. And always avoid anything with sharp edges in a turtle habitat. Your turtle could seriously hurt itself. Another option is an above-tank basking platform, which will let you fill your tank closer to the top to give the turtles more room to swim. You can buy them ready-made or build one yourself like I did. I made it from wood, Plexiglas, and a piece of "egg-crate" light diffuser. You can't see it in most of pictures on the site because they were taken before I built it, but you can see a picture of it here. Most turtle keepers use heat-proof metal tank covers on top of their tank. These screens are inexpensive and are important mainly because they help protect the turtles from things like broken glass from exploding lamp bulbs. The lamps used for turtle habitats get very hot and tend to explode if they get splashed with water, and sometimes even if they don't. The covers also help keep the turtles from climbing out of the tank, which they do tend to try sometimes. Tank covers can also be clamped to the tank to help prevent larger turtles from climbing out, which they can sometimes do if the distance between the top of the water or basking area and the rim of the tank is within the turtle's reach. Don't use glass or Plexiglas as a tank cover. Either one will filter out UVB rays that the turtle needs to survive, and the heat from the lamps may cause glass to shatter or Plexiglas to melt. Because even screen-type tank covers block some light and heat, you should adjust the lighting to be correct with the tank cover on the tank. When you have to remove the tank cover (for example, to feed your turtle or clean the tank), replace it as soon as possible so you don't overheat the habitat. If you're going to leave it off for more than a few minutes, turn off heat-producing lamps or move them a little farther away to keep the basking temperature from getting too hot. I also recommend that you use the widest-mesh screen you can find, or better yet, just make one out of hardware cloth of at least 1/4-inch mesh. It blocks much less light. Otherwise consider using a 7.5 or 10.0 UVB lamp rather than a 2.5 or 5.0 to compensate for the loss of some of the light. Lighting is so important a subject for turtle keepers that it has its own page, which can be found here. But basically, you are going to need lights to provide visible light (artificial daylight), warmth, UVA, and UVB light. We talk more about these different kinds of light and the lamps needed to make them on the turtle lighting page. The substrate is the stuff that covers the bottom of the tank or habitat, and there are lots of different opinions about what are the best and worst substrates to use. What follows here is my opinion. Others may disagree. First of all, unless you are going to use live plants, there's really no reason to have a substrate at all for most popular aquatic turtle species like Sliders and Painteds. A glass bottom is easiest to clean and eliminates the possibility that your turtle will eat the substrate and be injured by it (which does sometimes happen). Another easy-to-clean option is to use large, flat rocks. Remember to boil them first to kill any algae or germs. If you're going to use live plants (except floating plants), or if you just want a substrate because you think it looks nice or creates a more natural environment, then you have several choices. Fine sand is a popular substrate that many turtle hobbyists like. But I think sand is a terrible substrate. I find it very difficult to keep clean even with frequent vacuuming. In my opinion, the only reason to use sand is if you're keeping turtles who dig in it in their natural habits, such as soft shell turtles. But that's just my opinion. Many other turtle keepers disagree with me and think sand is a great substrate that's easy to clean. If you do choose to use sand, use clean, fine sand (like the sand they sell for children's sand boxes) and clean it thoroughly before putting it in the tank. You also have to clean it very frequently once the habitat is set up, or else pockets of poop and debris will cause your entire tank to become a big, stinky mess. Aquarium Gravel is another substrate that I don't like. It's not a very good plant substrate because it contains little or no nutrient value for the plants. Also, turtles sometimes eat gravel; so unless it's very smooth and the pieces are large enough that a turtle can't eat them, I don't think it's worth the risk. Fluorite. Personally, I think Fluorite is the best choice for a planted turtle tank. Fluorite is a porous clay gravel that's designed for use in planted aquariums. It's an excellent root medium for plants, it looks very natural and attractive, and I've never seen a turtle eat it. However, when you first fill the tank, it will make the water look like mud. I just let the dust settle, and then then let the filter run for a few days with nothing in it except aquarium filter floss or polyester pillow stuffing (which is basically the same stuff, only less expensive). It usually takes a day or two and several floss changes before the water is clear. Crushed coral. If you're planning to keep saltwater or brackish-water turtles, then crushed coral is another good substrate. It can also be used as a partial substrate (that is, mixed in with another substrate) in a freshwater habitat if you live in a place where the pH of your tap water is <u>always</u> low. The calcium will leach out of the coral and raise the pH of the water, as well as help buffer it to keep the pH more stable in the future. Crushed coral is not a very good substrate for rooted plants, though. You can also use crushed coral as a filter medium to correct low pH conditions, which usually is a better solution to low pH than mixing it with the substrate, especially if the low pH problem is temporary. 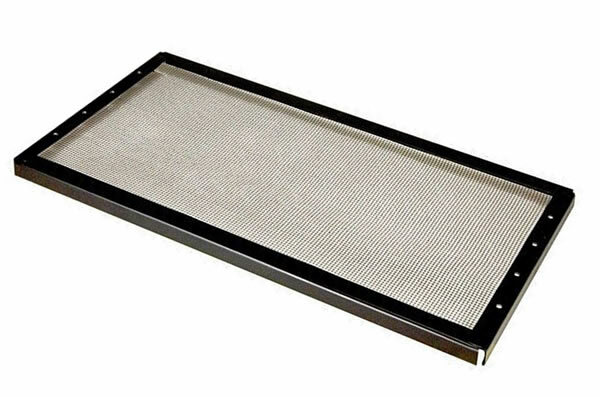 It's easier to change the filter media than it is to change the substrate. In addition to the above, there are other accessories you'll need for your turtle habitat, like a heater (or better yet, two heaters in case one stops working) to heat the water, thermometers to measure the temperature, a stand for the tank or habitat, and lights and a way to attach them. 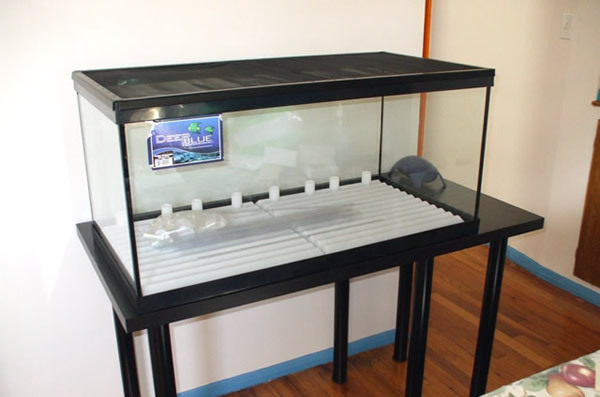 All of these things can be purchased at pet shops that sell aquarium and reptile supplies, and some of them (like the stand) can be home-made or improvised. You can find all kinds turtle supplies at Amazon. That's where I buy probably 90 percent of the things I need for my turtles. And with Amazon Prime, I get free two-day shipping on most items. Try an Amazon Prime 30-Day Free Trial . Please read the pages about heat, lighting, and water quality before setting up your turtle's habitat. If you're planning to include live plants, also read our plants page. And remember: This is a hobby, so it's supposed to be fun. Take your time and build a habitat that your turtle will love and that you will be proud of.